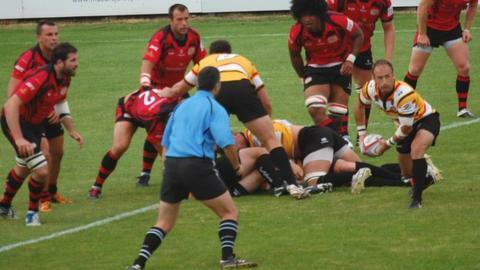 A hat-trick from Canadian winger Matt Evans helped Cornish Pirates to victory over Championship newcomers Jersey. The islanders went ahead early on through Ross Broadfoot's penalty, but trailed 8-3 when Evans touched down just before half-time. Jersey narrowed the gap thanks to a Michael Le Bourgeois penalty, but Evans scored his second soon after and his late try in the corner sealed the win. It was Jersey's first home league defeat in nearly a year. The island side have made St Peter a fortress on their rise up through the national leagues, which has seen them clinch four promotions in five seasons. But the Pirates, last season's play-off finalists, were too strong in what was the islanders' first ever match in the second tier of English rugby in front of 2,470 fans. "We knew they were going to be a strong side," said Jersey director of rugby Ben Harvey. "It's disappointing because I felt in the first half individual errors were letting us down more than anything else. "We came out in the second half and another individual error let us down again and at this level you just can't afford that. "The boys will learn from that and they'll get better and better as time goes on." Cornish Pirates featured seven new faces in their starting line-up but still appeared to show more Championship know-how, particularly in the second period. "We're very happy and if you'd offered us that result before kick-off we would've taken it," said Pirates backs coach Harvey Biljon. "We took a couple of opportunities, we should have taken a couple more. "I think Jersey were a pretty impressive outfit, they've definitely recruited well, and I don't think they'll have any problems this season in the league."